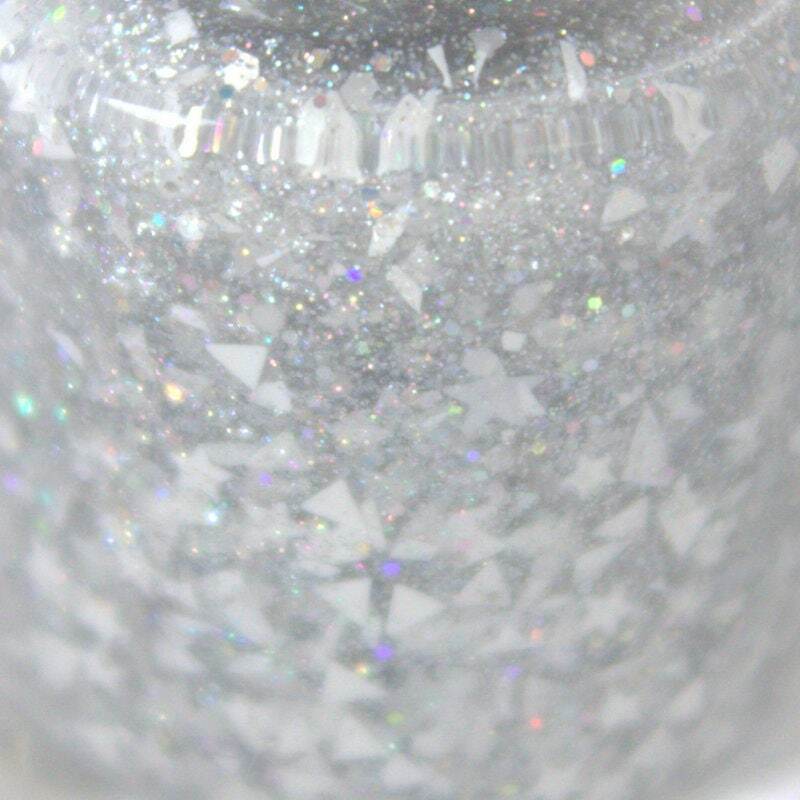 Snow Blind - Silver holographic and white glitter nail polish loaded with multiple sizes and shapes including stars, triangles and shreds in a clear base. Absolutely dazzling in bright light. 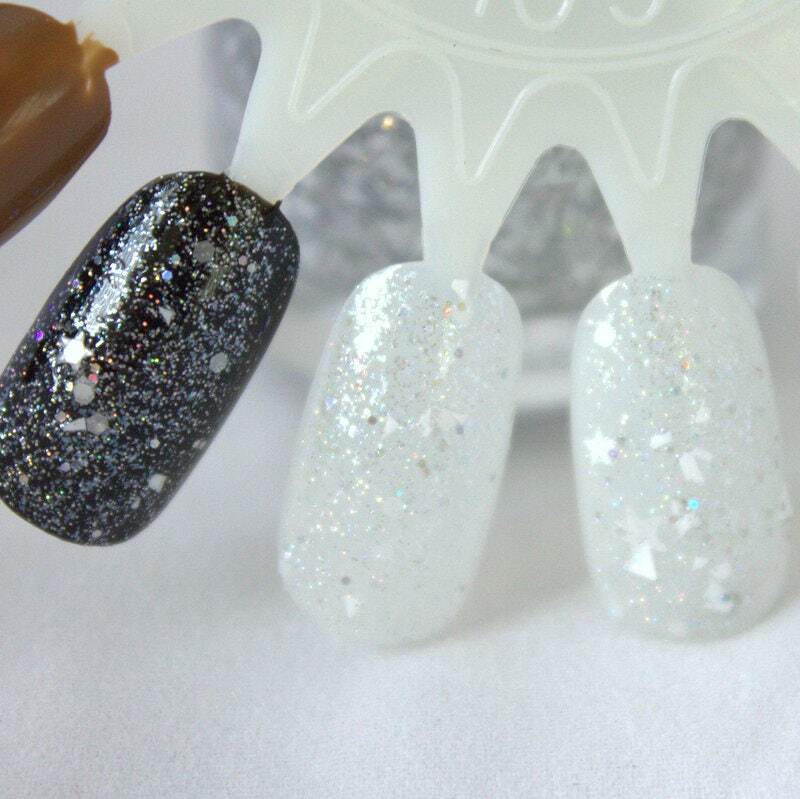 Wear alone for sheer sparkle or top a dark colored polish. Wheel 1- 1 coat over no base, 2 coats over no base, 2 coats over no base. Colored with cosmetic grade mica pigment (where applicable) and all glitters are solvent resistant to prevent curling and discoloration. No carmine in any products. Some settling may occur during shipment. All polishes contain stainless steel mixing balls just like your regular polish. Just give it a good shake. I pack a ton of glitter in my polishes, if you find it too thick you can add a couple drops of nail polish thinner (not nail polish remover). I try to take the best pictures possible to show accurate color and shapes. Some colors may appear slightly different on different monitors. This is a standard size (15 ml). All polishes are made in small batches. Some slight variations may occur. Policies Payment We use Etsy Direct Checkout and Paypal. 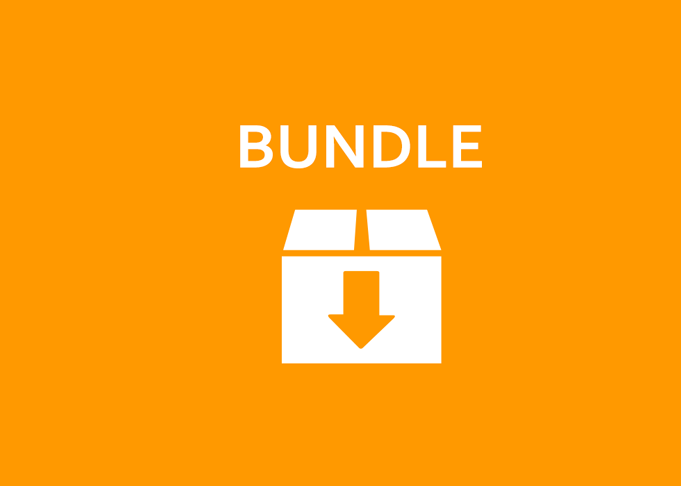 Policies Shipping Most orders ship within 24 hours excluding Sunday and Holidays. All listings state 1-3 business days as a precaution. 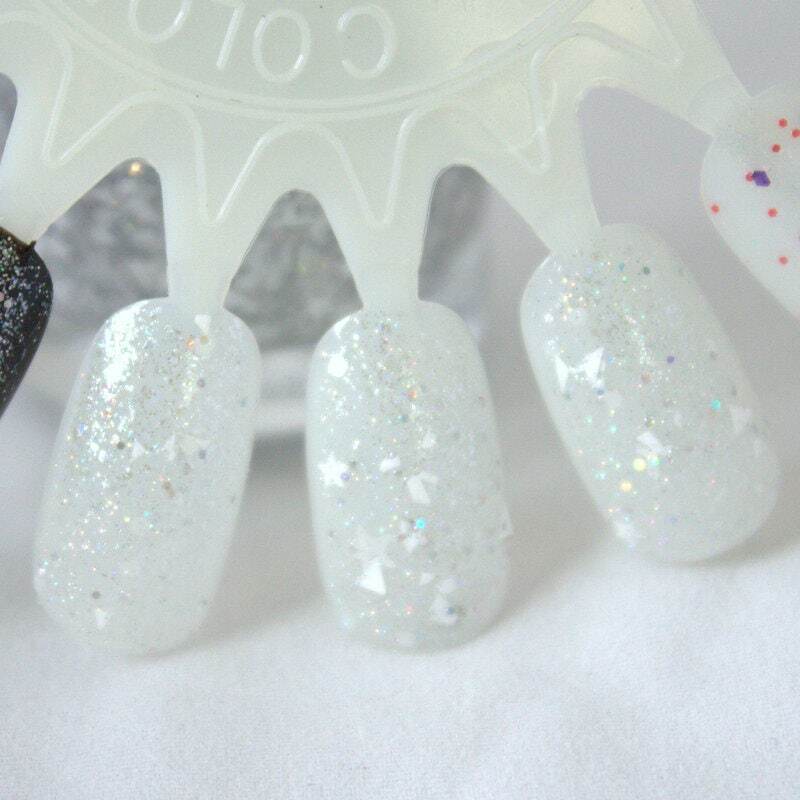 International Orders - Glitterfied Nails polishes are now available for international shipping. Please make sure your address is correct before placing an order. Packages returned for incorrect address will not be refunded. Please be aware of your country's customs fees/duty/VAT. You are responsible for any and all fees levied by your country. Packages returned refused by recipient will not be refunded. International shipping is expensive and slow. Shipping rates are set based on the United States Postal Service fees plus $2 for packaging materials. It can take anywhere from 2 - 6 weeks for delivery. Most items are received within 2 weeks. Policies Refunds I will gladly replace any damaged products. Just send me a photo of the damaged item and packaging to andrea(at)glitterfiednails.com within 24 hours of delivery and I will get a replacement in the mail the next day. Additional Info I certainly want you to be happy with your purchase. Please keep in mind there is no expressed or implied guarantee that my polishes will match any other existing polish. I create each polish as the unique essence of a theme or color scheme. Exact color matching is not available.